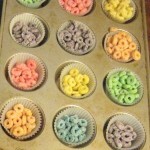 Fruit Loops - Edible Color Activities for your Preschooler! You are here: Home / Fun Activities For Kids (By Age) / Activities for Babies / Fruit Loops – Edible Color Activities for your Preschooler! Fruit Loops – Edible Color Activities for your Preschooler! We rarely eat sugary cereal, which made this activity even more fun for our kids! It was great, better than a babysitter! Kept my preschoolers entertained for over an hour! 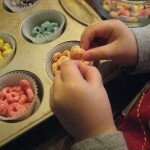 Maybe these Fruit Loops activities will help you wash your dishes in peace. Who can find the smallest Fruit Loop? Who can find a broken green Fruit Loop? Are there more purple or blue fruit loops? Which muffin tin has the most? Which has the least? After sorting the Fruit Loops, we practiced making and predicting with patterns. We would put two green, two purple, two green, well, you get the drift. My daughter loved figuring out what color would go next. She’s 3.5 years old. She then had a blast creating her own patterns and having me guess what would come next… but my son (2.5) was bored out of his mind! Poor kid! He kept wanting to eat them! He struggled through the pattern making fun. Fine Motor Skills. Other than the actual eating this was their favorite part! 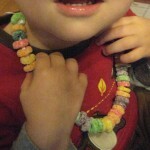 The kiddos made necklaces and bracelets with the Fruit Loops. They had to practice hand and eye coordination as they stringed the cereal onto the ribbon. We learned how the cereal disintegrates if you try to string wet, partially eaten pieces. My preschoolers loved learning with the Fruit Loops and were a sticky, sugar crazed mess by the time our snack time had ended! Thanks to Muffin Tin Mondays for motivation! We love our muffin tin snack times! Check out our other MTM snack-time activities. Now this looks like an activity that Mommy would enjoy, too! I did! They played and ate quietly for an hour! I “helped” intermittently and had a mess to clean up afterwards, but I LOVED the quiet! My kids love sorting food. It’s my 5 year old’s favorite “school” activity. I even made a graphing chart for him to use when sorting M&Ms so he can show me which color has the most/least and how many he needs to eat to make them equal! .-= Keeslermom´s last blog ..Procrastination Pays Off =-. What a great blog you have! I have a 19 month old and not a creative bone in my body so I will be visiting here often for some great ideas in the future. I love the activity. Thanks for laying out why you did it! .-= JDaniel4’s MOm´s last blog ..Holidays are a Time for Family Storytelling- Mommyhood Tip =-. That looks fun and possibly messy too. I really liked Fruit Loops as a kid, but it’s funny everything somehow can end up being messy as a kid. I’ve got the m&m graphing ready to run. What do I do next? .-= Keeslermom´s last blog ..Dirty Teeth??!! =-. 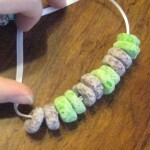 Great idea…I have tried it with pipe cleaners instead of ribbons. It makes it much easier for little two year old hands. .-= Gab´s last blog ..Why to choose canister vacuum? =-. I just love this idea! I am going to have to do it with Will. I think he will totally love it! Cheerios now makes colorful cereal just like Fruit Loops without alot of sugar. Our favorite librarian, Ms Krystal, used them to make colorful necklaces when she had a Dr Seuss storytime featuring the book, My Many Colored Days. My kids and I had a BLAST trying to copy her patterns!